It’s often said that an area has “something for everyone,” but in Schoolcraft County, that’s more than just talk. Begin in the town of Manistique, nestled on the shores of Lake Michigan, where you can take a leisurely stroll or a fast-paced fitness run along our acclaimed waterfront boardwalk, see one of Michigan’s most photographed lighthouses, view a historic water tower and unique bridge once featured on “Ripley’s Believe It Or Not,” and shop in quaint stores, enjoy great food and comfortable accommodations. 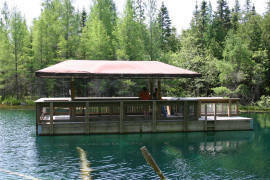 A short drive away you will marvel at the emerald-green depths on a raft ride across the famous Kitch-iti-kipi(the “Big Spring”), step back into early Michigan and Native American history at the Bishop Baraga Shrine, and learn the real story of the ill-fated “Christmas Tree Ship” as you visit their last port of call or experience the past as you never have before when you tour the haunted and haunting Seul Choix Point Lighthouse and Museum. From Manistique you’ll discover your Schoolcraft County adventure has just begun. Hike through the scenic Rainey Wildlife Area or Seney National Wildlife Refuge where you’ll spot loons, geese, eagles, herons, cranes, and four-legged creatures of all kinds. Spend your night camping at Indian Lake State Park or take to the backcountry of Hiawatha National Forest, which includes the sprawling and secluded Big Island Lake Wilderness Area. Whatever you’re seeking, you’ll find it right here in Schoolcraft County, and whether you’re visiting for a day, a week, a month or a lifetime, we welcome you.